Patchhhhhhhhwwwwworrrrrrk! Say it for the people! Say it for the children! Do you think Obama's entire inaugural address could be set to the tune of Rhythm Nation? It's undoubtedly best not to find out, but what a speech! It was especially nice to have a president acknowledge what every American already knows: hey, we're all different, and that's a good thing. So put away the one size fits all rhetoric of the past, and enjoy the pretty fruits of our collective, cobbled together heritage, design style. Patchwork quilts and pillows have long held the symbolic weight of history -- a scrap of grandpa's shirt here, a square of baby's first blanket there, and in time a singular piece of fabric weaves together the stories of generations. 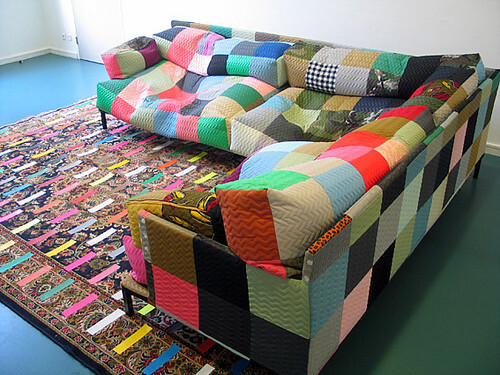 Perhaps the zeitgeist of changing history is sweeping through the land, because patchwork is EVERYWHERE, but this ain't your grandma's country quilt. Nosireeebob, patchwork can be modern, even mod. 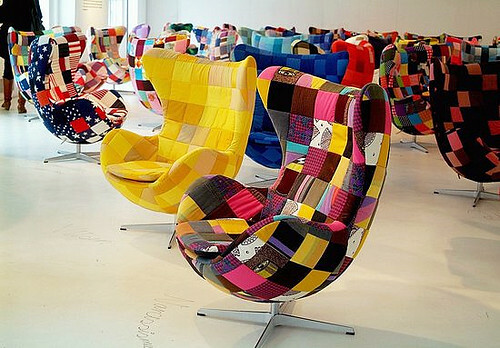 Arne Jacobsen's seminal Egg Chair, reconfigured by artist Tal R, is bright, bold, and one of kind -- awww, just like us. Look! There's even a stars and stripes model. And that actually makes me... proud. 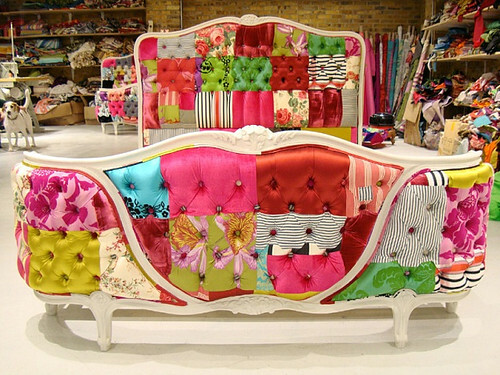 Can you even imagine all the labor that must have gone into the tufting on that headboard?! And I enjoy peeking into their studio in the background... 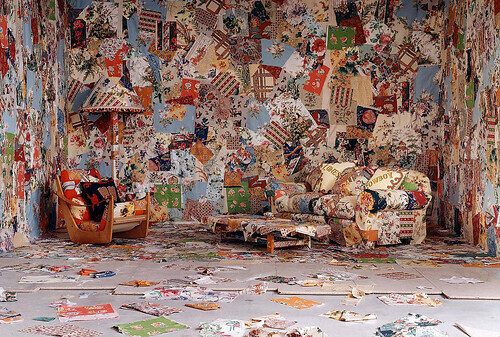 I would love to rifle through their stacks and stacks of fabric scraps. But for me, the real prize is that kissing bench. Momma like. 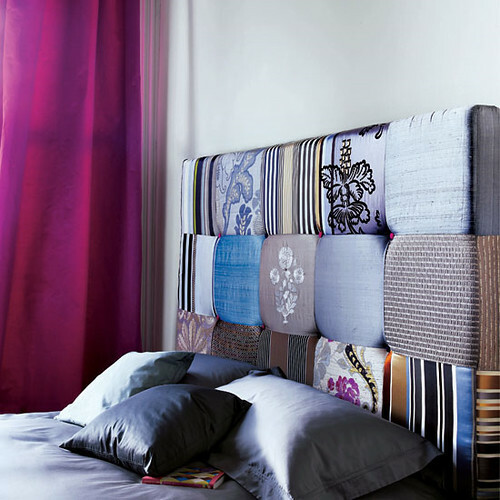 This headboard featured in Living Etc is a little more DIY friendly, but still patchylicious. I love the tiny red buttons hidden in the tufts, like secret surprises only sleepers can see. 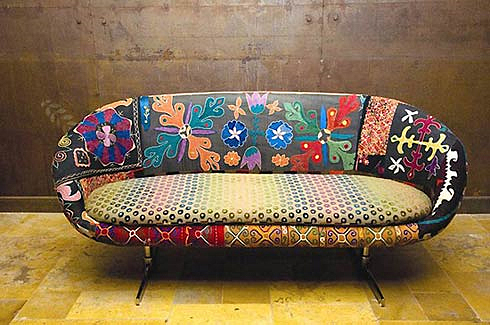 For some global flava, these patchwork couches made of treasured Turkish tapestries by Bojka are singularly spicy and delicious. 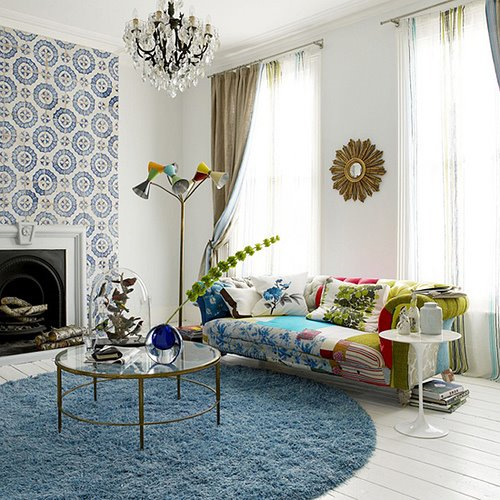 Found on super blog, Double Takes. 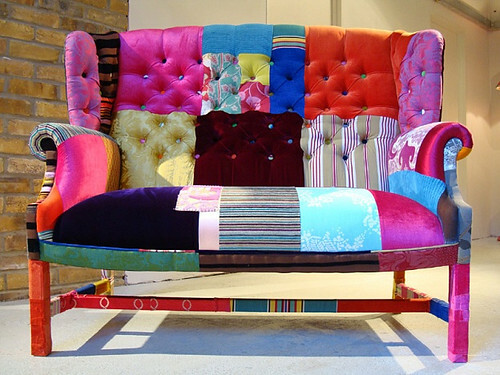 Ok, this patchwork beanbag couch by Bertjan Pot is kind of like something my grandma used to have, but it's so much more squishy and inviting than grandma's hard, lumpy, bumpy seating. I envision a sleepover party with pillow fights and popcorn, but don't eff up my rad duct tape rug, you messy beasts. We can't let fabric have all the fun. 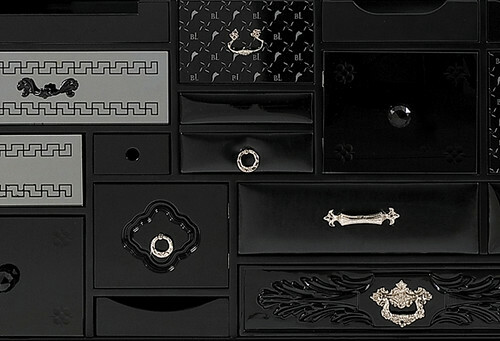 Welcome to the patchwork party, crazy case goods by Boca do Lobo (designers with a cute wolf logo). 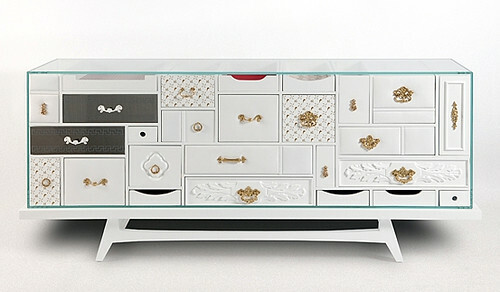 This inspires me to paint all the drawers in my buffet table different colors, although I think I might fail to capture the full range of awesomeness without some mad carpentry skillz. 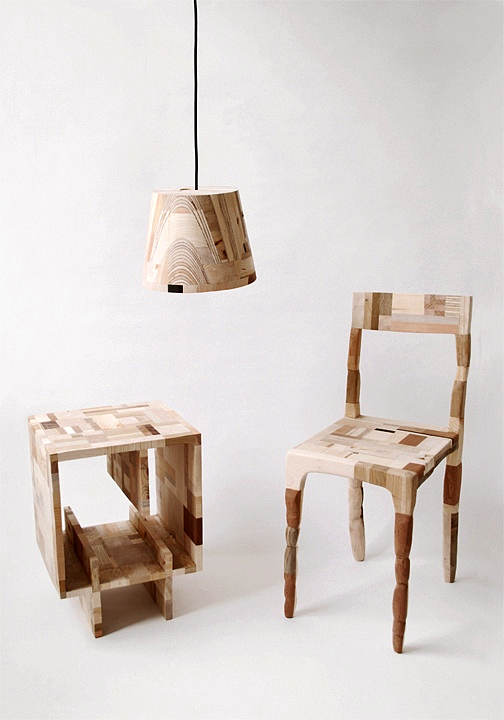 I'm sure fitting all those tiny pieces of wood waste and off-cuts together into something -- anything -- was challenging. 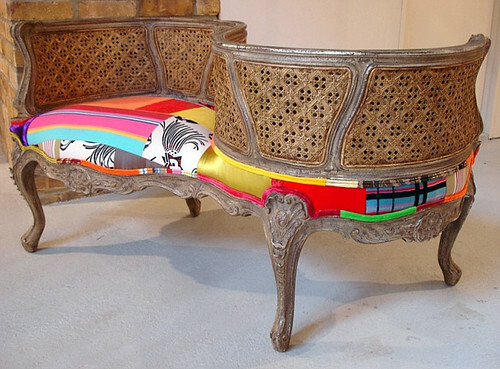 Making an actual load bearing chair out of scrap is pretty damn impressive. Good job, Amy Hunting! I'm a woozy floozy for pretty much anything in Paul Evan's Cityscape series. 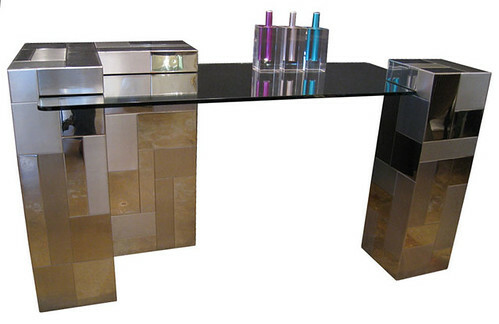 Super shiny patchwork metal casing + ultra square lines = unmitigated lust on my part. Meow. Both pieces available at 1st Dibs if you got the money, honey. Yes, the times they are a changing. So why don't we all sit down over some tea to talk about it? 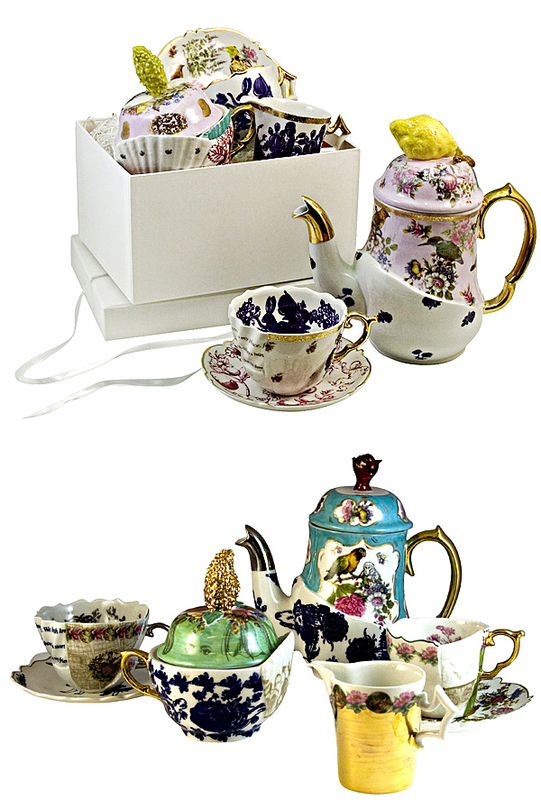 This Tea For Two set by Vika Mitrichenka is sure to get the conversation flowing. How about, you say "Toe May Toe" and I say "If you break my fancy tea set, this happy fun time tea party is over, pronto." Oh, alright. I say "Toe Mah Toe." Because, thanks to Obama I'm feeling warm and fuzzy like that.